Today we have a photograph of the top of one of the Low-Band Antenna (LBA) aerials. This is the so-called "LNA cap". 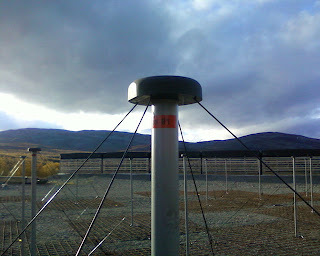 The black disc at the top of the post in the photograph contains the two Low-Noise Amplifier (LNA) units which increase the strength of the very weak electrical signal that is created from the reception of the radio waves. The LNA cap is potted with resin to keep the unit water proof. The output from the LNAs goes into coaxial cables that run down the grey post. The red band on the post is just the label... in this case "01" (aerial L01 in the sequence L00-L47). There is also a bar code on the label for easy scanning and identification of the aerial. The LNA cap of LBA aerial L01. Photo: D. McKay-Bukowski.